The following quotes come from the book The Teachings of George Albert Smith, authored by eighth president George Albert Smith. 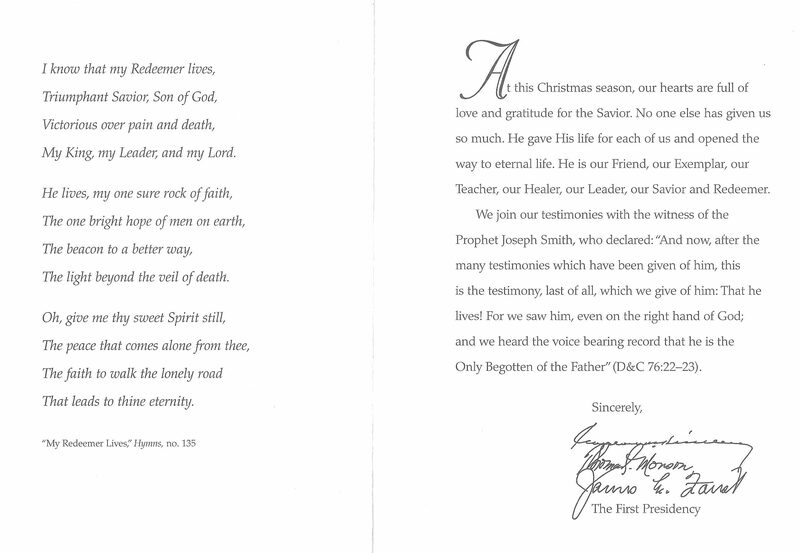 This was an employee gift by the First Presidency in 2000. To visit the site with all of the books and quotes from these, go here. “There is no doubt in our minds that baptism is essential to salvation. Evidently the Redeemer of mankind believed it was. He in whose name we hope to gain eternal exaltation, and through whom we hope for a glorious resurrection, who came into the world and laid down his life that we might live again, thought it was important and necessary, and yet there are many of our Father’s children who do not understand and do not believe that the Lord requires it of all men” (George Albert Smith, The Teachings of George Albert Smith, p. 88). “And yet the larger proportion of this world do not now know the contents of the Bible. Most of those who have read it and are familiar more or less with its text do not know after all these years how to interpret it. The Lord has given to us the power to interpret it. He gave to the Prophet Joseph Smith the privilege of retranslating it, if I may use that term. (CR, October 1948, pp. 163-65. )” (George Albert Smith, The Teachings of George Albert Smith, p. 57. Italics in original). “Church membership does not guarantee a place in the celestial kingdom. What a privilege it is to worship the Lord and to do it in the way he has indicated. There are some people who are members of the Church—their names are on the record, and they have an idea that that is all that is necessary—but the time will come when they will have to face their record, and their admission into the celestial kingdom will be conditioned upon the way they have observed the advice of our Heavenly Father right here upon the earth. How grateful we ought to be, not to be uncertain as to where we are going. (CR, October 1950, p. 5).” (George Albert Smith, The Teachings of George Albert Smith, p. 35. Italics in original). “All have an equal opportunity to inherit eternal life. One of the beautiful things to me in the gospel of Jesus Christ is that it brings us all to a common level. 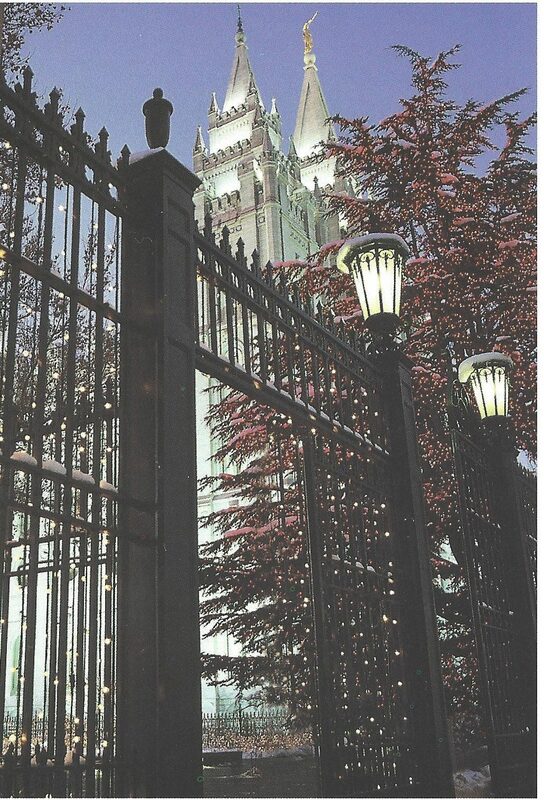 It is not necessary for a man to be a president of a stake, or a member of the Quorum of the Twelve, in order to attain a high place in the celestial kingdom. The humblest member of the Church, if he keeps the commandments of God, will obtain an exaltation just as much as any other man in the celestial kingdom. The beauty of the gospel of Jesus Christ is that it makes us all equal in as far as we keep the commandments of the Lord. In as far as we observe to keep the laws of the Church we have equal opportunities for exaltation. (CR, October 1933, p. 25. )” (George Albert Smith, The Teachings of George Albert Smith, pp. 35-36. Italics in original). “Grave consequences await those who purposely do not have children. How will those feel who fail to obey that first great command when they stand in the presence of the Creator. . .. How can they comply with that invitation if they have no children to take to the Father? They must remain childless throughout eternity” (George Albert Smith, The Teachings of George Albert Smith, p. 118. Italics in original. Ellipsis mine). “Sometimes our brethren and sisters of other faiths feel that we are egotistical in the claim we make. That this is the only church recognized by the Lord is our claim. This is our Father’s work, and he established it. The Lord himself declared to Joseph Smith that he was not pleased with the churches that existed in the world, in the year 1820. 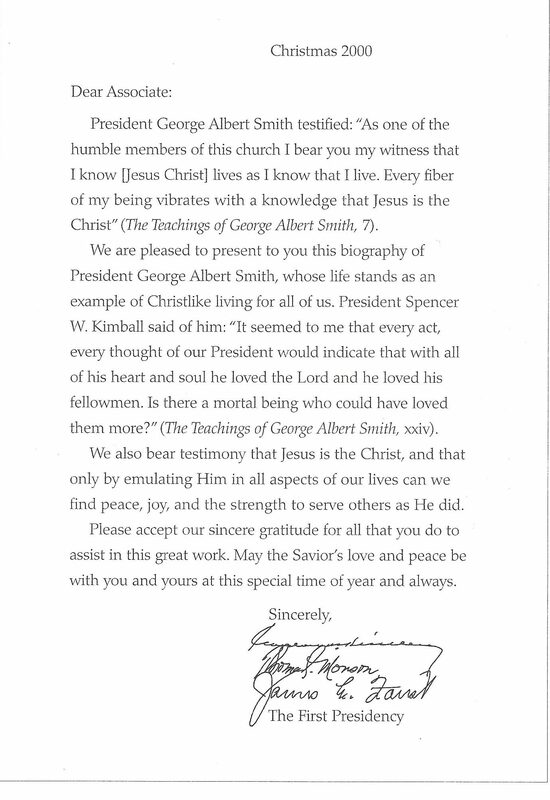 That does not mean that he was not pleased with the virtues of those humble people who went to him in prayer and desired to learn of his will, but he was not pleased with the man-made churches, and the unauthorized ministers who preached for doctrine the commandments of men” (George Albert Smith, The Teachings of George Albert Smith, pp. 38-39). “Those who oppose and find fault will not find joy in their opposition. Those who criticize and seek to destroy the influence of the leaders of the Church will suffer the result of their wrongdoing. (CR, April 1934, p. 29. )” (George Albert Smith, The Teachings of George Albert Smith, p. 65). “There is only one pathway of safety for me in this day and that is to follow those whom the Lord has appointed to lead. I may have my own ideas and opinions, I may set up my own judgement with reference to things, but I know that when my judgment conflicts with the teachings of those that the Lord has given to us to point the way, I should change my course. If I desire salvation I will follow the leaders that our Heavenly Father has given to us, as long as he sustains them” (George Albert Smith, The Teachings of George Albert Smith, p. 69). “Other religions have truth, but the Saints are sharing the fullness of the gospel. The gospel of Jesus Christ was restored in the year 1830, after centuries of darkness had passed. When the call was given, the missionaries of The Church of Jesus Christ of Latter-day Saints went out into the world—not to criticize others, not to find fault, but to say to our Father’s other children: ‘Keep all the good that you have received, keep all the truth that you have learned, all that has come to you in your homes, in your institutions of learning, under your many facilities for education, keep it all; and then let us divide with you additional truths that have been revealed by our Heavenly Father in our day” (George Albert Smith, The Teachings of George Albert Smith, p. 158. Italics in original). “We must keep the commandments of our Heavenly Father. We are told in other scriptures that those who do not keep the commandments of God will forfeit their right to the blessings of the celestial kingdom” (George Albert Smith, The Teachings of George Albert Smith, p. 34). “Those who speak at conference receive revelation. It is by faith that we are edified on occasions like this, by those who minister in the name of the Lord, and the Comforter quickens their understanding, bringing things past to their remembrance and showing them things to come; thus evidencing the spirit of revelation. (CR, October 1913, p. 103. )” (George Albert Smith, The Teachings of George Albert Smith, p. 75). “Those who follow the devil are not aware of it. A man once said to me—or remarked in a place where I happened to be—‘Why, these people here seem to think I am full of the devil, but I am not.’ And I said to him, ‘My brother, did you ever know anybody that was full of the devil and knew it?’ That is one of the tricks of the devil: to get possession of you and keep you from knowing it. And that is one of our difficulties. (CR, April 1948, p. 179. )” (George Albert Smith, The Teachings of George Albert Smith, p. 22. Italics in original). “God is not incomprehensible; he has revealed himself to man. The Lord has blessed us with a knowledge that he lives, and has a body, and that we are created in his image. We do not believe that he is some kind of essence or that he is incomprehensible” (George Albert Smith, The Teachings of George Albert Smith, p. 1. Italics in original). “Those who have belittled Joseph Smith will be forgotten. Much has been said in this conference about the Prophet Joseph Smith. There isn’t much that I could say, except that which is good. Many of the benefits and blessings that have come to me have come through that man who gave his life for the gospel of Jesus Christ. There have been some who have belittled him, but I would like to say that those who have done so will be forgotten and their remains will go back to mother earth, if they have not already gone, and the odor of their infamy will never die, while the glory and honor and majesty and courage and fidelity manifested by the Prophet Joseph Smith will attach to his name forever. (CR, April 1946, p. 181-82. )” (George Albert Smith, The Teachings of George Albert Smith, p. 45. Italics in original). “Latter-day Saints will be judged according to their opportunities. A knowledge of pre-existence has been given to the Latter-day Saints; a knowledge that we are here because we kept our first estate, and that we have been given the opportunity of gaining eternal life in the presence of our Heavenly Father by keeping our second estate. We will not be judged as our brothers and sisters of the world are judged, but according to the greater opportunities placed in our keeping. We will be among those who have received the word of the Lord, who have heard his sayings, and if we do them it will be to us eternal life; but if we fail, condemnation will result. (CR, October 1906, p. 47. )” (George Albert Smith, The Teachings of George Albert Smith, p. 31. Italics in original). “The reception of the Holy Ghost is dependent upon obedience. It is not those who say ‘Lord, Lord,’ who enjoy the companionship of his spirit but those who do his will. If we are not more perfect in our lives, if we are not more righteous than those who are not of our faith we will be behind them in receiving the blessings of our Heavenly Father; but if we obey the commandments, if we keep ourselves clean, pure and unspotted from the sins of the world, his power will rest upon us, and the virtues of the third and fourth generations of the Church will be builded upon by following generations, and the purity of their lives will establish a race that will people the earth. (CR, April 1913, pp. 28-29. )” (George Albert Smith, The Teachings of George Albert Smith, p. 90). Italics in original). “The Church does not compel obedience. I am grateful that I belong to a church that does not compel obedience. The Church of Jesus Christ of Latter-day Saints does not coerce. The gospel of Jesus Christ is a gospel of love, intelligence, a wonderful guide for our lives. That is what it is for. It is for everybody. Yet we find people who resist the very thing that would make them happy. They will not live the gospel but seek happiness only in the pleasures of life that will not endure. (CR, April 1941, p. 26. )” (George Albert Smith, The Teachings of George Albert Smith, p. 97. Italics in original). “Obedience in this life is a foundation for eternal happiness. The fact that we have been baptized into the Church is not sufficient. The fact that our names are on the Church records is not sufficient. . . therefore we cannot drink with the drunken, we cannot debauch our lives, we cannot be dishonorable in our dealings with our fellowmen and gain celestial glory. We must keep the commandments of our Heavenly Father. We are told in other scripture that those who do not keep the commandments of God will forfeit their right to the blessings of the celestial kingdom” (George Albert Smith, The Teachings of George Albert Smith, p. 97. Italics in original. Ellipsis mine). “Obedience protects us from evil. No matter whether the clouds may gather, no matter how the war drums may beat, no matter what conditions may arise in the world, here in The Church of Jesus Christ of Latter-day Saints, wherever we are honoring and keeping the commandments of God, there will be protection from the powers of evil, and men and women will be permitted to live upon the earth until their lives are finished in honor and glory if they will keep the commandments of our Heavenly Father. (CR, April 1942, p. 15. )” (George Albert Smith, The Teachings of George Albert Smith, p. 98. Italics in original). “All born into this world kept their first estate. We ascertain that not only was the Savior in the beginning with the Father, but also that you and I were there. We dwelt there, and by reason of faithfulness, having kept our first estate, we have been permitted to come into this world and receive tabernacles of flesh. The fact that we are living in the flesh is evidence that we did keep our first estate. (CR, October 1906, p. 48,)” (George Albert Smith, The Teachings of George Albert Smith, p. 15. Italics in original). “A physical body is a reward for premortal faithfulness. We believe in a pre-existence. The Lord has taught us that in the scriptures, but there are millions of those who profess belief in the Holy Bible who do not believe in, or at least do not understand, what pre-existence really means. They do not realize that we lived before we came here; they do not comprehend that this body has been given to us as a reward for faithfulness in the spirit world before we came here. They do not know that by partaking of certain ordinances prescribed by our Heavenly Father, we, as husbands and wives, may be united for time and eternity and enjoy the companionship of our children forever. How thankful we should be for that knowledge that has come to us (CR, October 1923, p. 70,)” (George Albert Smith, The Teachings of George Albert Smith, pp. 15-16. Italics in original). “The words of the prophets are always vindicated. When our Father in Heaven speaks to the world, no matter how feeble or weak the servant may be who carries the message, that word will be vindicated, even if it involves the destruction of many souls. (CR, April 1904, p. 62).” (George Albert Smith, The Teachings of George Albert Smith, p. 65. Italics in original). “Some people appear to think that if they have attended religious meetings, or performed some portion of the service required of them on Sunday, they are then at liberty to go to ball games, pictures shows, or resorts of various kinds, and still continue to enjoy the favor of the Master. I say to you that if they persist in doing things of that kind, members of the Church will lose their faith; and the Spirit of our Heavenly Father will withdraw from them. (CR, April 1923, pp. 77-78. )” (George Albert Smith, The Teachings of George Albert Smith, p. 85). “We lose the Spirit when we do not honor the Sabbath. Those who do not honor the Sabbath and keep it holy displease [God]. Some people appear to think that if they have attended religious meetings, or performed some portion of the service required of them on Sunday, they are then at liberty to go to ball games, picture shows, or resorts of various kinds, and still continue to enjoy the favor of the Master. I say to you that if they persist in doing things of that kind, members of the Church will lose their faith; and the Spirit of our Heavenly Father will withdraw from them. (CR, April 1923, pp. 77-78. )” (George Albert Smith, The Teachings of George Albert Smith, pp. 108-109. Italics and brackets in original). “Our people have been taught to take the sacrament with the right hand; we believe that is appropriate, and proper, and acceptable to our Father. The sacrament should not be accepted with a gloved hand; nobody should receive it in that irreverent manner. We should partake of it in humility, with preparation of clean hands and pure hearts, and with a desire to be acceptable to our Father; then we will receive it worthily, and rejoice in the blessing that comes to us by reason of it. (CR, April 1908, p. 36. )” (George Albert Smith, The Teachings of George Albert Smith, p. 93). “It is observed that men and women who go from year to year without partaking of the Lord’s Supper gradually lose the Spirit of our Heavenly Father; they forfeit its companionship where they have had opportunity to participate in that blessing, but have failed to take advantage of it” (George Albert Smith, The Teachings of George Albert Smith, p. 95). “Think of the devotion and the faithfulness of those who day after day go into these temples and officiate for those who have passed to the other side; and know this, that those who are on the other side are just as anxious about us. They are praying for us and for our success. They are pleading, in their own way, for their descendants, for their posterity who live upon the earth, many of whom, because they have been unwise, have been betrayed into fighting the Church and kingdom of God and opposing those who are its leaders. (CR, April 1937, pp. 34-35. )” (George Albert Smith, The Teachings of George Albert Smith, p. 27). “The Lord knows what is harmful to our bodies. How foolish I would be . . . to partake of these forbidden things, having the assurance that it is the counsel of the Lord I should abstain therefrom. I would feel under condemnation if I should partake of them, when he who knows better than anybody else says that they are harmful, and has warned me against them. (CR, April 1907, pp. 19-20. )” (George Albert Smith, The Teachings of George Albert Smith, p. 102. Italics and ellipsis in original). “Parents who keep the Word of Wisdom will transmit virtues to their children. I feel that the Latter-day Saints have in the Word of Wisdom a law that will exalt them and lift them above those who fail to keep it. As I have already said, fathers and mothers, if they will keep the Word of Wisdom, may transmit to their offspring virtues and strength that they could not otherwise give to them. I believe that the companionship of the Spirit of our Father will be in the hearts and homes of those who keep this law, and their desire to be obedient will be transmitted to their children. (CR, April 1907, p. 21. )” (George Albert Smith, The Teachings of George Albert Smith, p. 103. Italics in original).